TV show dates: September 19, 2016 — May 7, 2018. 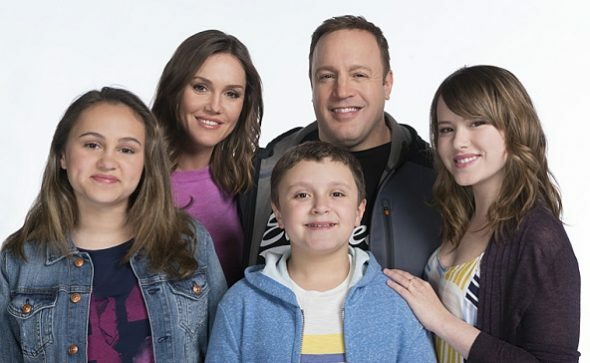 Performers include: Kevin James, Erinn Hayes, Mary-Charles Jones, James DiGiacomo, Taylor Spreitler, Ryan Cartwright, Leonard Earl Howze, Gary Valentine, Lenny Venito, and Leah Remini. This traditional sitcom revolves around Kevin Gable (Kevin James), a newly retired police officer who lives in Massapequa, New York. After 30 years on the force, Kevin’s looking forward to relaxing and spending quality time with his wife Donna (Erinn Hayes) and their young kids — Sara (Mary-Charles Jones) and Jack (James DiGiacomo). When his oldest daughter Kendra (Taylor Spreitler) announces she’s dropping out of college to support her tech-wizard fiancé, Chale (Ryan Cartwright), Kevin knows his only choice is to move them both into his converted garage to keep her in school. Kevin was going to rent it out for extra money and now finds that he may need to find another job. Kevin’s former work buddies graduated from the Academy with him, served on the force together, and retired at the same time. They are Goody (Leonard Earl Howze), Kyle (Gary Valentine), and Duffy (Lenny Venito). When the second season kicks off, Donna has died, and Kevin is working for his old partner, Vanessa Cellucci (Leah Remini), at her security firm. What do you think? Did you like the Kevin Can Wait TV show? Should CBS have cancelled or renewed it for season three? Kevin Can Wait: Will King of Queens Actors Appear on the New CBS Sitcom? Why did they kill off Donna? And to try to replace her with Leah Remini?? That ruined the show! It was trying too hard to be KING OF QUEENS. If they had left Donna on and just added Leah, I think the ratings would have stayed. It became too much about the security company and less about the family. THAT was what made it a good sit-com. Sorry to have seen it change but once it did, I was glad to see it go. They ruined it.